How to Make a Fast Food Burger Even MORE Unhealthy! As I mentioned in my last blog post, I seem to have become a magnet for other people’s “junk food confessions.” In a similar vein, it seems that because I blog about the dangers of processed foods, my friends and acquaintances also feel compelled to horrify me with text messages and emails featuring the most surprisingly processed stuff they can get their hands on! In this case, my buddy Mike has really outdone himself. LOL! 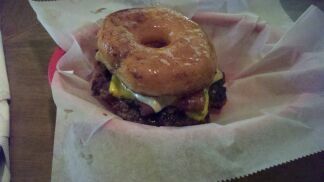 This entry was posted in Health Effects and tagged burger, donut, food, junk, unhealthy. Bookmark the permalink. ← Are YOU a “Junk Food Confessions” Magnet? Now, I must say in my defense & the establishments, it wasnt a fast food joint, it was a bar. And I wouldn’t necessarily say its completely processed…I did watch him make the patty by hand. Lol! But it wasnt the preformed frozen crap from the fast food chains. And it was frickin amazing. 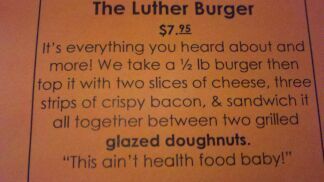 They dont hide it.. Its not health food. Its a “try it once & maybe again next year.” Those who get addicted, have problems. The owner of the bar gets worried about ppl coming in on a regular basis getting these burgers. Of course no one is under the impression that this is health food. LOL! I’m sure it tastes great, and that’s why they serve it and that’s why people eat it 🙂 There’s nothing to defend…They brag right on their menu that it’s not healthy food (and, again, I’m sure that’s obvious to anyone ordering it, anyway. lol), and it caught my attention because it’s such unhealthy food…so there’s nothing we disagree about, you see? 🙂 Mike, you know that I would never suggest that everyone should eat healthfully ALL of the time, and I am not attacking whoever makes this – it’s not like they are responsible for how often someone chooses to indulge in something like this. I am mearly bringing to folks’ attention that it exists. Perhaps on my deathbed, when a physiological reaction would no longer matter…I’ll ask you to bring one of these to me! Of course…you might want to grab two, so you don’t eat all of MINE on your way over! Ha!